Samantha Sullivan earned a Bachelor of Science degree in Mathematics with a specialization in Statistics from The College of New Jersey in 2017. She began her career at the USGS as a Pathways Intern in 2016. During this time, she helped code a program from SAS to R that performed MOVE.1 regression to estimate characteristics of low flows. For her senior project, she implemented multiple regression, score regression models, and cluster analysis to estimate flood magnitude and frequency for NJ streams and rivers. Lastly, she utilized change point analysis to detect changes in loads due to the increasing implementation of management practices in agricultural and urban areas designed to decrease stream loads. Currently, Samantha is a Statistician for the USGS. She is working with the NAWQA team to help convert code from SAS to R that performs data wrangling and nutrient calculations on water quality data across the United States. She is also updating streamflow statistics for continuous-record streamflow gaging stations and low-flow partial-record stations. Within the realm of statistics, Samantha interests are in nonparametric statistics, multivariate statistics, regression analysis, statistical programing, data wrangling, data analysis, and data modeling. She wants to use her statistics knowledge in order to help the USGS organize, describe, and interpret their data. 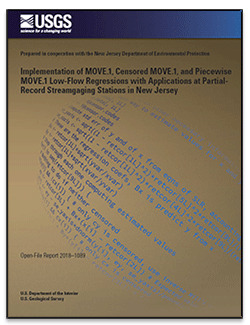 Colarullo, Susan J.; Sullivan, Samantha L.; McHugh, Amy R.
Colarullo, S.J., Sullivan, S.L., and McHugh, A.R., 2018, Implementation of MOVE.1, censored MOVE.1, and piecewise MOVE.1 low-flow regressions with applications at partial-record streamgaging stations in New Jersey: U.S. Geological Survey Open-File Report 2018–1089, 20 p., https://doi.org/10.3133/ofr20181089.